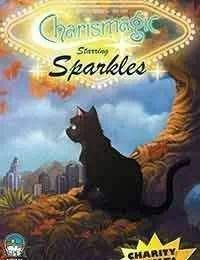 The special digital-exclusive one shot story story features the origin story of Sparkles, the popular talking cat from the pages of Aspens magical action-adventure series Charismagic! Join Sparkles as she discovers the true meaning of independence and loneliness while encountering a horrific creature of magical descent, and her very first encounter with Hank Medley! Aspen and Charismagic fans will not want to miss this exciting tale, with all of Aspens proceeds going to the Make-A-Wish Foundation!